It’s 1883, and newspapers are flying off the shelves in Calcutta, Edinburgh and London. Mary Pigot, lady superintendent of the Scottish Female Mission in Calcutta, has been charged by The Reverend William Hastie with mismanagement and immorality, and she’s fighting back! After ten years of hard work growing the mission, raising funds and educating women, Mary’s career is now in ruins. With nothing to lose, she takes her case to the Calcutta High Court and sues Hastie for malicious libel. A woman publicly suing a man! It’s just the type of scandal that sells lots of newspapers. In this riveting historical novel based on true events, political tensions in a Scottish mission in 19th-century Calcutta, India, give rise to a sexual scandal. Mary Pigot has been the superintendent of the Ladies’ Association Female Mission in Calcutta for 10 years before the Rev. William Hastie arrives in 1879. Hastie, the principal of the Scottish College, quickly finds fault with Pigot’s policies, practices, and mannerisms; for example, he feels that the orphanage that she manages isn’t up to Scottish standards of cleanliness. Hastie and his comrades also don’t agree with her proselytizing approach: “educate first, convert later—if ever.” Nor does Pigot share Hastie’s resentment toward members of the Free Church, which broke away from the Church of Scotland in 1843. She’s quick to assist anyone who needs help—even members of the local community whom Hastie finds questionable. The growing friction between Pigot and Hastie culminates in a formal investigation of the superintendent followed by libelous claims that she’s abusive, neglectful, incompetent, and immoral. Due to her casual demeanor with male colleagues, her enemies accuse her of “fornication” with an Indian man and a fellow missionary. To clear her name and take back her position, Pigot takes Hastie to court, leading to an unpredictable, sensational trial. Although the book is set in the 1800s, its approach to political, religious, cultural, and gender-related issues is surprisingly relevant. Wagner-Wright (Rama’s Labyrinth, 2015, etc.) paints India’s culture and climate in stunning detail: “March comes on like a slow fire. Another week, and we’ll have the humidity.” The realistic, intricate characters take turns narrating the tale, panoramically revealing themselves through their perceptions. At one point, for example, Hastie narrates, “I stop and take a breath, composing myself for this audience of fools.” The plot’s first half proceeds at an unhurried pace, but when the trial starts, its momentum resembles that of a competitive sporting event. Wagner-Wright’s extensive research allows her to stay remarkably true to history while her creativity brings an outstanding story of courage and fortitude to life. A powerful story with a vivid setting, compelling plot, and multifaceted characters. Sandra Wagner-Wright saw a reference to the Pigot v. Hastie trial and was immediately intrigued. Sandra’s research into the case led her to the British Library, Mission Archives in Edinburgh, and a site visit in Calcutta where she visited the High Court where Mary Pigot’s trial took place. Sandra taught women’s history for over 20 years. Based on a true story, Two Coins is Sandra’s second work of historical fiction. Sandra Wagner-Wright holds the doctoral degree in history and taught women’s and global history at the University of Hawai`i. When she’s not researching or writing, Sandra enjoys travel, including trips to India, China, and St. Petersburg, Russia. Sandra particularly likes writing about strong women who make a difference. She lives in Hilo, Hawai`i with her family and writes a weekly blog relating to history, travel, and the idiosyncrasies of life. Check out Sandra’s webpage. 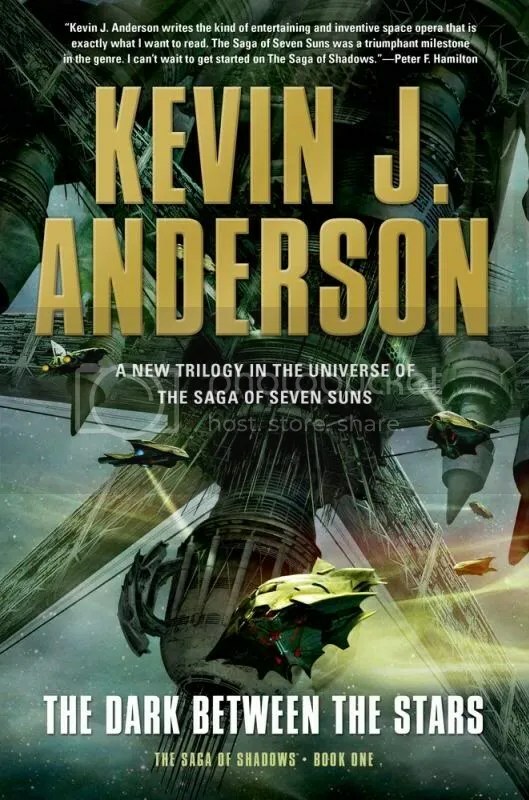 On Friday, June 27th Kevin J. Anderson will have a guest post on Bookbanter, talking about his new book, The Dark Between the Stars, among other things. Here’s an excerpt of Anderson’s new book, which can be found here. He had to run, and he fled with the boy out into the dark spaces between the stars. Garrison Reeves stole a ship from the Iswander Industries lava-processing operations on Sheol. Though he’d planned his escape for days, he gathered only a few supplies and keepsakes before departing, careful not to give his wife any hint of what he intended to do. None of his possessions mattered more than getting safely away with his son. He knew the disaster could come soon—any day now. Lee Iswander, the Roamer industrialist, dismissed Garrison’s concerns about third-order tidal shifts in the broken planet; Garrison’s own wife, Elisa, didn’t believe him. The lava miners paid little attention to his warnings, not because they disputed his geological calculations, but because they didn’t want to believe. Their priorities were clear. Adding “unnecessary” and expensive levels of redundant shielding and “paranoid” safety measures was irresponsible, both to Iswander Industries and to the employees, who participated in profit-sharing. Lee Iswander had commissioned follow-up reports, biased reports, that painted a far rosier picture. Garrison didn’t accept them. So he made his choice, the only possible choice. He stole one of the company ships, and when she found out about it, Elisa would claim that he stole their son. He flew out of the Sheol system, running far from any Roamer settlement or Confederation outpost. Elisa was not only an ambitious woman, she was abusive, tenacious, and dangerous—and she would come after them. He needed a head start if he had any hope of getting away. The ship was a standard Iswander cargo transport, a workhorse, fully fueled with ekti, run by an efficient Ildiran stardrive. Garrison could fly the vessel without special training, as he could fly most standard spacecraft. Ten-year-old Seth rode in the cockpit next to him. Garrison made a game of familiarizing the boy with cockpit systems and engine diagnostics, giving him simple navigation problems to solve—as any good Roamer father would, even though Garrison had chafed under how his stern father had raised him. He would not make the same mistakes with Seth. Roamers were free spirits, sometimes deprecatingly called space gypsies, whose clans filled niches too rugged and dangerous for more pampered people—places such as the Sheol lava-processing operations. He had followed Elisa there because of her promotion in Iswander Industries. Now, Garrison hated to admit that his father had been right. Though anxious, the boy was glad to be with his father. Seth respected his mother, even feared her, but he loved his father. Elisa never let down her walls—not with any business associate, not with Garrison, not even with her own son. “Will I be able to go to Academ now?” Seth asked. The Roamer school inside a hollowed-out comet had always fascinated the boy. He wanted to be with the children of other clans, to have friends. Garrison knew his son would be happier at Academ, but Elisa had refused to consider sending their son there. Unlike other Roamer children, Seth hadn’t grown up in a pleasant domed greenhouse asteroid or on the open gas-giant skies of an ekti-harvesting skymine. Rather, his daily view was a blaze of scarlet magma erupting in a smoke-filled sky. All the personnel of the lava-mining facility lived in reinforced habitat towers mounted on pilings sunk down to solid rock. More than two thousand employees, specialists of various ranks—engineers like Garrison himself, metallurgists, geologists, shipping personnel, and just plain grunt workers—filled shifts aboard the smelter barges or control towers, surrounded by fires that could have inspired Hell itself. No other parents kept their children here. Sheol was no place for a family, no home for a boy, regardless of the career advancement opportunities for Elisa. As the two closely orbiting halves of the binary planet adjusted their dance of celestial mechanics, Garrison had analyzed the orbital pirouette, uncovering fourth-order resonances that he suspected would make the fragments dip fractionally closer to each other, increasing stresses. He studied the melting points, annealing strengths, and ceramic-lattice structure of the habitat and factory towers. And he realized the danger to the Iswander operations. Alarmed, he had presented his results to Lee Iswander, only to be rebuffed when neither the industrialist nor his deputy—Garrison’s own wife—took his warnings seriously. Iswander impatiently told Garrison to go back to work and reassured him that the lava-processing outpost was perfectly safe. The material strength of the structural elements was rated to withstand the environment of Sheol, although with little margin for error. When Garrison insisted, Iswander grudgingly brought in a team of contract geologists and engineers who found a way to rerun the calculations, to reaffirm that nothing could go wrong. The specialists had departed with surprising haste—worried about their own safety? Garrison still trusted his own calculations, though. Next, he felt it was his responsibility to warn the Sheol employees, which infuriated Elisa, who was sure that his whistle-blowing would cost her a promotion. After scanning the star catalog, the boy chose coordinates that qualified as little other than “the middle of nowhere.” The stardrive engines hummed and changed tone as they adjusted course, and the vessel streaked off again. Because there were no other children on Sheol, Seth had longed for a competent computerized companion, probably a Friendly model who could keep him company and amuse him. At the lava-mining facility, Lee Iswander used only a handful of Worker compies, none of which were the more sociable types, not even a Teacher compy. “Your mother didn’t see the point in owning a compy,” Garrison said. “But maybe we can revisit that.” After we see what happens. “Elisa’s not a Roamer, but Lee Iswander comes from a good clan,” he had responded, though the words sounded flat in his own ears. But Garrison had refused to listen and married Elisa Enturi anyway. He’d given up so much for her … or had he done it just to act out against his father? He had wanted a family, a fulfilled life, and Elisa wanted something else. “If we find a place and settle down, will Mother come to live with us again?” Seth asked. Garrison could not envision any other answer but Maybe someday. Still running, they crossed the expansive emptiness for days, and then they encountered an amazing anomaly: a cluster of gas bags far outside of any star system. Each bloated globule was twice the size of their ship. The membranous bubbles drifted along in a loose gathering with nothing but light-years all around them. In the dim light of faraway stars, the spherical structures appeared greenish brown, and each filmy membrane enclosed a blurry nucleus. Hundreds of thousands of them formed an island in a sea of stars. A random glimmer of light brightened one of the nodules, an internal flash that faded. Then another bloater flickered and quickly faded. Copyright © 2014 by Kevin J. Anderson. Reprinted with permission. All Rights Reserved.